VA Still Arbitrarily Cutting Caregivers From Program, Even As It Aims To Expand Congress told the VA to expand its caregiver program to include pre-Sept. 11 vets, but the VA has failed to meet a deadline in the law. Ret. Sgt. Chris Kurtz and his wife Heather Kurtz pose for a portrait on the couch in their living room. Chris Kurtz is trying to keep his sense of humor. Even after the VA told him last summer that he no longer needs a caregiver. 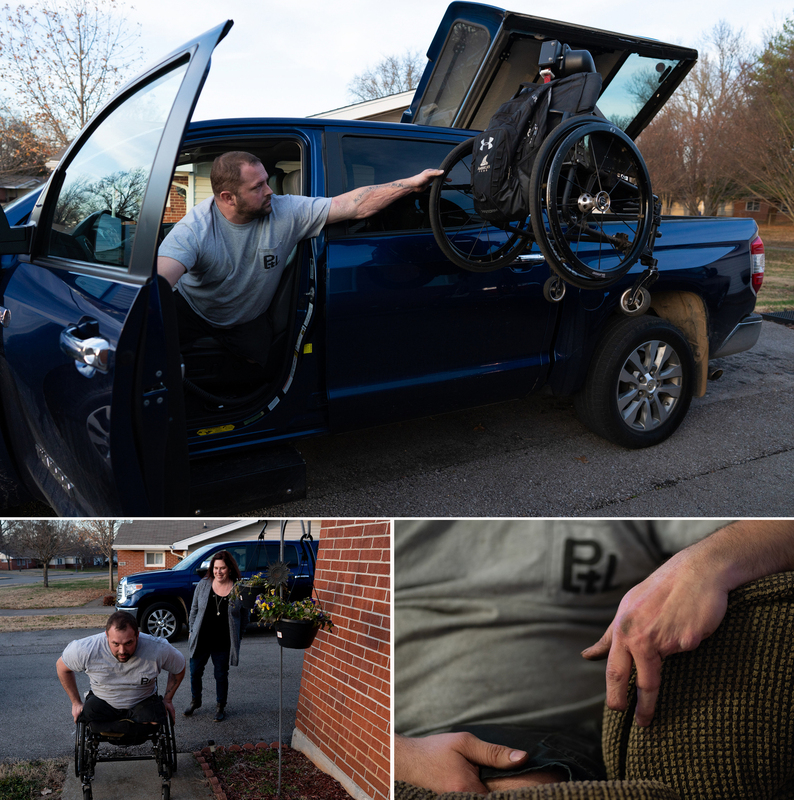 "Apparently my legs grew back, I dunno," he says with a laugh, and sinks into his couch in Clarksville, Tenn. And then he mentions that he probably can't get out of the couch without help from his wife. Caretaker Ashlee Williams helps her husband, Former Staff Sgt. J.D. Williams, begin the process of putting on a prosthetic leg. In December 2010, a bomb blast ended his Army deployment to Afghanistan. He lost both legs above the knee and half of his left hand. Heather, then his fiancée, joined him at Walter Reed Army Medical Center and the VA suggested she apply for their new caregiver program. The program was set up to support family members of Iraq and Afghanistan veterans. They're mostly wives and mothers who receive a VA stipend to provide home health care that would otherwise cost the VA millions of dollars. When it started in 2011, vets signed up in huge numbers, quickly overwhelming the VA staff assigned to the program. In recent years many VAs have drastically cut their rolls — often with little explanation to the caregivers. Top, Ret. Sgt. Chris Kurtz waits for his chair after arriving home. Bottom left, Kurtz wheels himself up to his front door as his wife and caretaker Heather Kurtz follows behind. Bottom right, Kurtz rests his hand, which is missing fingers from his injury. The cuts come at a time the program is supposed to be growing. Congress approved a major expansion of the program in May, though implementation could take years. Congressional sources confirmed that the VA has missed its first deadline in October to implement new information technology for the caregiver expansion — raising serious concerns of further delay. VA says the department will not deploy the new system until it is ready and has been tested thoroughly. But VA also recently blew through a deadline to fix the IT for a new GI bill rule, and did so without initially telling Congress about the delay. Jillyan Motter holds her younger brother Gabriel Kurtz. Chris and Heather Kurtz had been getting the highest level of support — Tier 3. That meant a stipend, health care for Heather and quarterly visits from a nurse. But earlier this year, Heather Kurtz was told her standing in the program was being evaluated. And without anyone from the VA even coming to see them, the Kurtzes got dropped in July. Not reduced to a lower tier, but simply told that Chris no longer needs any help from Heather. "He's all better now, all better," she said sarcastically as Chris laughed. "So he doesn't need a caregiver for anything." "It was part of my identity. And then to have a letter tell me, 'Well you're no longer on the caregiver program,' it hurt like a punch in the gut. Because I didn't stop caregiving. I've always been a caregiver and I always will be," she says. The home of Ret. Sgt. Chris Kurtz and Heather Kurtz on base at Fort Campbell. The Kurtzes are not alone. Just across the border near Bowling Green, Ky., Ashlee and J.D. Williams also got bad news, around Thanksgiving. J.D., a former Army sniper, lost three limbs in a bomb attack in Kandahar. He's fiercely independent, and he still finds ways to bow-hunt and target shoot. But he can't do basic things like put on his prosthetic legs without help from Ashlee. "It's a 24/7 job," she says. "If he wants to put his legs on he needs assistance. He wants a shower, he needs assistance. It's not my choice. I worked full time before, at a job I enjoyed. [I had] to walk away from that." The Williams were demoted to Tier 1 of the program — but once their story got negative media attention, they were quickly restored to a higher tier. Still, Ashlee Williams says the way the decision was so easily changed makes her nervous. Former Staff Sgt. J.D. Williams poses for a portrait with his wife and caretaker Ashlee Williams. "We're in the clear right now — but for how long? It could be next month and they reassess us again," she says. An NPR report this year found that some VAs across the country have cut their rolls drastically. The VA says it's part of standardizing the program and removing some vets who never should have qualified. But a VA inspector general report in August found that about half the time, the VA wasn't adequately monitoring the veteran's health when it dropped them. "So many caregivers are having issues," says Williams, "and there's no one to look at their case." 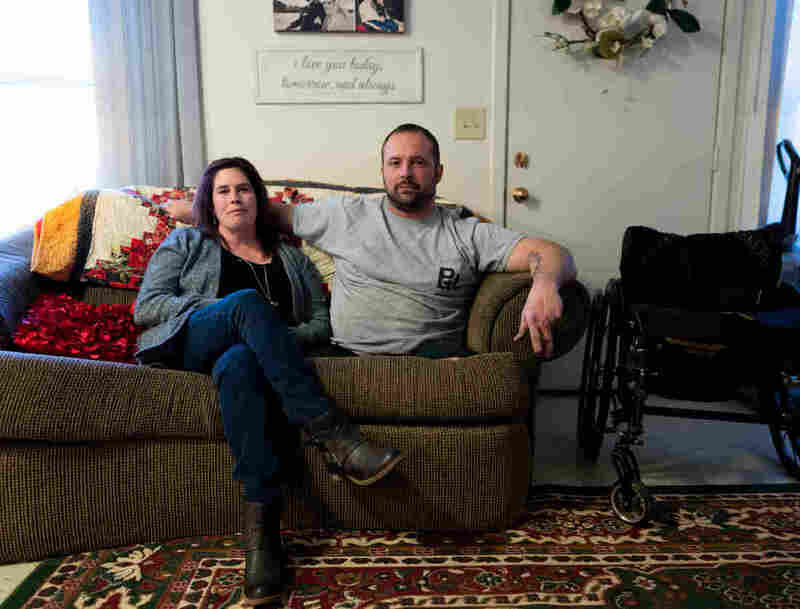 That's certainly true for the Tennessee Valley VA. From 510 caregivers on its rolls early last year, there are now only 104 — a drop of 80 percent. It's not only Tennessee. A VA spokesman said nationally the total number on the program has decreased slightly as facilities more accurately and consistently identify veterans who meet eligibility criteria for the program. Caretaker Ashlee Williams helps her husband, Former Staff Sgt. J.D. Williams, put on one of his prosthetic legs. But it doesn't feel more accurate to Sherman Gillums — he's a paralyzed former Marine who uses the VA in Washington, D.C. His wife is his caregiver. 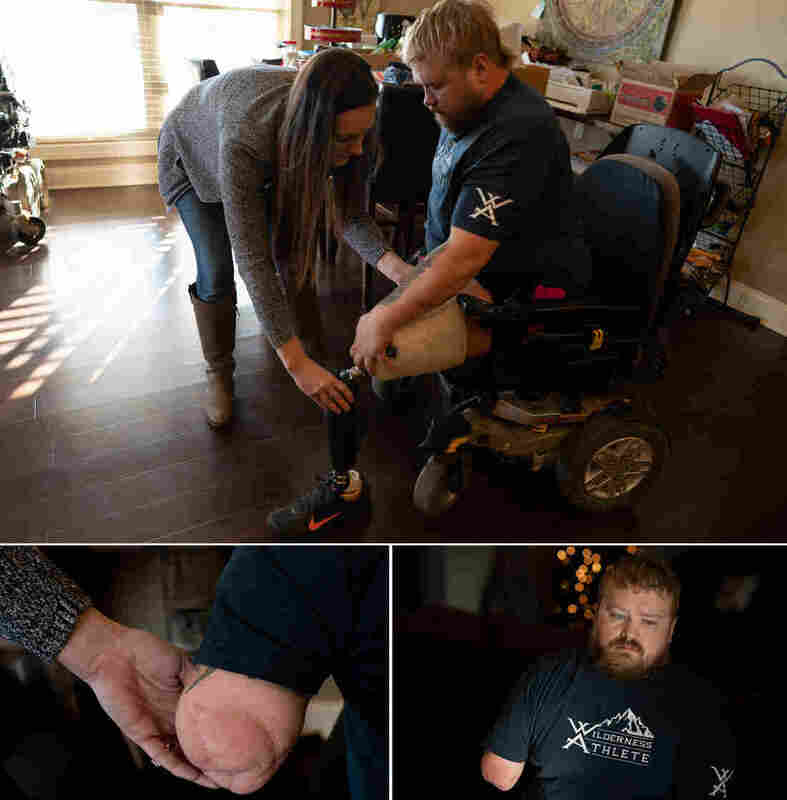 "I was also told that in order to stay on the program, that I needed to have gotten treatment in the VA within the last year," he says, "or else I'll be removed from the program." Gillums says he had been to the VA for treatment. He thinks either the administrator who contacted him didn't seem to have complete access to his health records, or it was something worse. "You could take that as just informing me of the policy or it seems like a veiled threat — that's just how I took it," he says. Gillums is also a senior official with one of the country's largest veterans organizations, AMVETs. And he's the vice chairman of the VA's own caregiver advisory committee. He thinks there's an effort to shrink the program. "I characterize it this way — beginning a purge," Gillums says. Old wheelchairs and prosthetic legs sit in a corner of Former Staff Sgt. J.D. Williams' home. He says getting the program fixed is crucial — because it's about to grow five or six times bigger. Congress passed a law in May, the VA Mission Act, which begins expanding the program to caregivers for veterans who served before 9/11, starting with vets from World War II, Korea and the Vietnam era. VA Secretary Robert Wilkie told NPR last month that improvements in the program are underway. "I think we are close to fixing that. What was the Mission Act has done [is] provided us with more resources to go out into the community and find those families that we have not been supporting, from the Vietnam era in particular," Wilkie said. 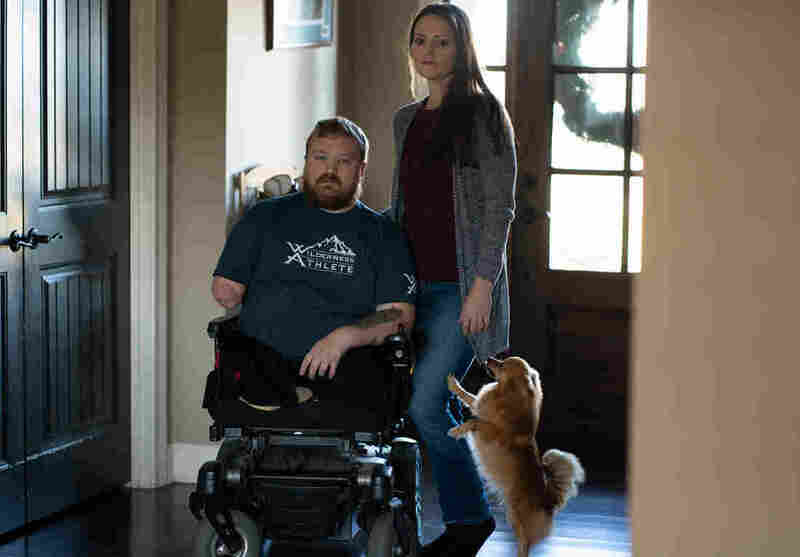 Families like Paula and Chris Minger in Temecula, Calif. Chris suffered an abdominal wound in 1973, and complications led the VA to rate him 100 percent disabled. Paula has been taking care of him — without any VA stipend — for over 30 years. 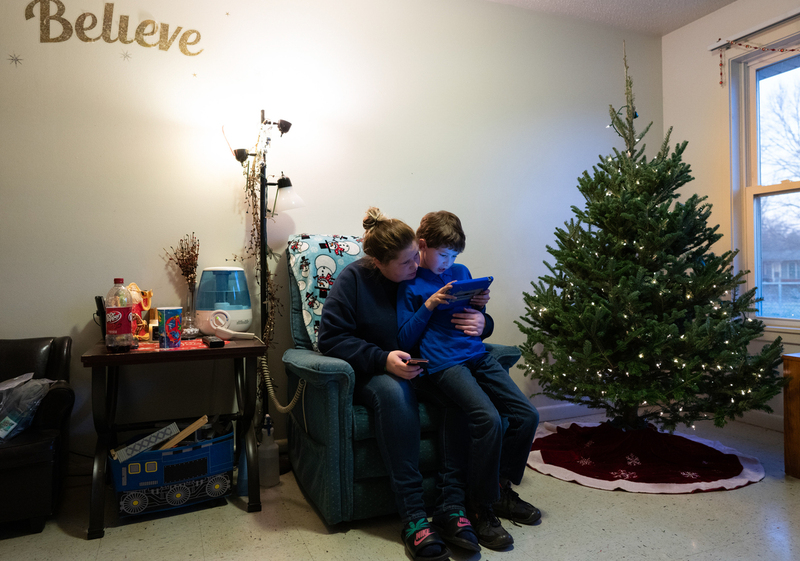 He's in and out of the hospital, and now he's often bedridden at home. Former Staff Sgt. J.D. Williams practices shooting with his bow in his backyard on Dec. 11, 2018. 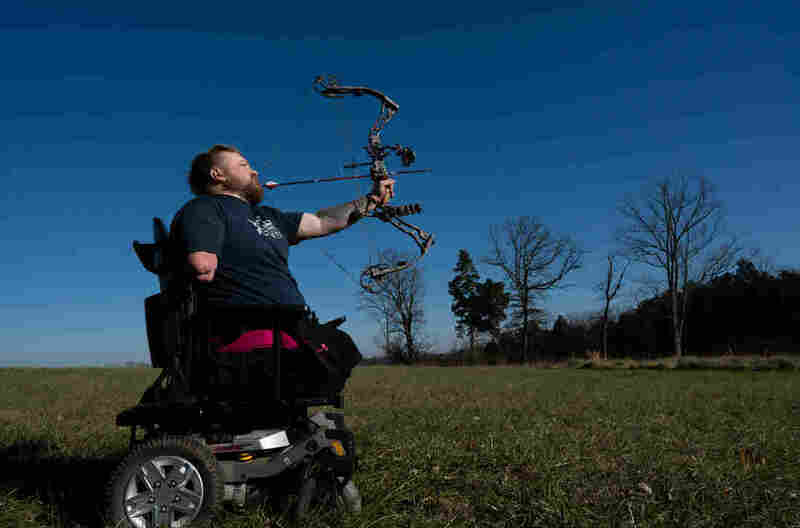 Williams uses his love of hunting not only as therapy for himself but for other disabled combat veterans. "He's probably just the most amazing guy I've ever known in my life. His mind is so good. He's an avid reader. He does everything he can to make himself better," she says. But now he's 68 and she's 67, and she'd love some help, so the caregiver expansion was great news. "I'm thrilled by it — I can't wait," Minger says. She'll have to wait, though. The timeline isn't clear for when the expansion will start. Bipartisan sponsors in Congress said they wanted to make sure to get the program right before rolling it out — particularly an update to the IT system. Congressional sources said it could be one to three years before Vietnam vets get in - but that hasn't been communicated to caregivers like Paula Minger, who thought she might be able to apply this spring. "I'm speechless," she said upon hearing the one to three year estimate. "Think how many will die before then."